Nestled high in the Pyrenees, Soldeu may not be Andorra's most attractive or popular holiday ski resort, but it's a great place for family holidays and provides excellent value for money for travellers on a tight budget. It's renowned for being cheerful and family orientated, and is rated as one of the best places in Europe for beginner skiers. 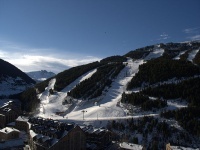 The village is located in the greater Grandvalira region, which incorporates neighbouring Pas de La Casa and has four other resort bases in the eastern half of Andorra. During the summer months, Soldeu is a popular destination for hiking, mountain climbing, and even white water rafting. During the winter months, the pistes below Pic d'Encampadana are covered in snow providing perfect conditions for skiers, snowboarders, and those who just enjoy the beauty of the frosted Pyrenees peaks. Despite the fact that Andorra is one of the few countries in the world that is blessed with duty free shopping, the resort of Soldeu is fairly limited when it comes to shops, with a sprinkling of small sports stores providing equipment and a supermarket for supplies. There are, however, a few fashion boutiques, gift and souvenir shops, and photography galleries. But most shoppers head to nearby La Vella, located about 30 minutes away via public bus, to go duty free shopping for perfumes, cosmetics, alcohol, tobacco, and designer goods. Soldeu's restaurants and cafes offer world-class cuisine and the majority of them can be found sprinkled along the main street and throughout the village. With French, Spanish, Italian, and local Pyrenean fare to choose from, visitors will have a tough time deciding where to dine. The highly popular Fat Alberts serves a delicious fillet steak, while other establishments offer fantastic views and a la carte menus. There is a plethora of cosy cafes and small takeaways along the main streets selling everything from baguettes and sandwiches to slices of pizza and more. Soldeu's nightlife is not as lively as neighbouring Pas de la Casa, but it does offer a number of fantastic bars and nightclubs providing plenty of after dark entertainment for holidaymakers. There are bars with live entertainment, with others showing sports events. There's enough for anyone looking for a wild night out after a long day on the slopes. Head to Fat Alberts for a great night out, where happy hour après ski drinks can be enjoyed, and live music and DJs keep the place going until the wee hours. There is a wide range of activities available for holidaymakers in Soldeu, it all depends on what time of year you visit. In the summertime, mountain climbing, hiking, and even white water rafting are popular. During the winter months, the skiing is excellent value for money. Advanced skiers can enjoy moderate off-piste skiing, as well as several black runs and even a spot of snow-mobiling for something different. Soldeu is also a good centre for snowboarders, with a well-equipped snow park featuring a half pipe and various jumps. Other popular activities in Soldeu are helicopter rides to view the spectacular mountain scenery of this fantastic holiday resort. Holidaymakers who are hoping to experience a wilder nightlife with a greater option of bars and clubs should consider staying at the nearby Pas de la Casa resort. Shopping options are also limited.